While this beautifully frenzied piece might be a challenge for some, I think it could be one of the more historically interesting tracks I’ve posted in a while. This recording is among the very first ever made in Uganda, meant for Ugandans. It’s exceptionally rare, and it has an interesting history. In 1930, there was a mad rush by the four major European record companies to explore the East African market, likely based somewhat on the sales success of the Gramophone Company’s first recordings of East African musicians (Zanzibari musicians, to be specific) made in Mumbai, beginning in 1927. By the time Spring of 1930 came around, the Gramophone Company had sent engineers back to East Africa to make additional recordings, Columbia was recording in April of 1930 on Zanzibar and in Dar Es Salaam in Tanganyika, and Pathé would soon ship Kenyan musicians from Mombasa to record taarab music in Marseilles. 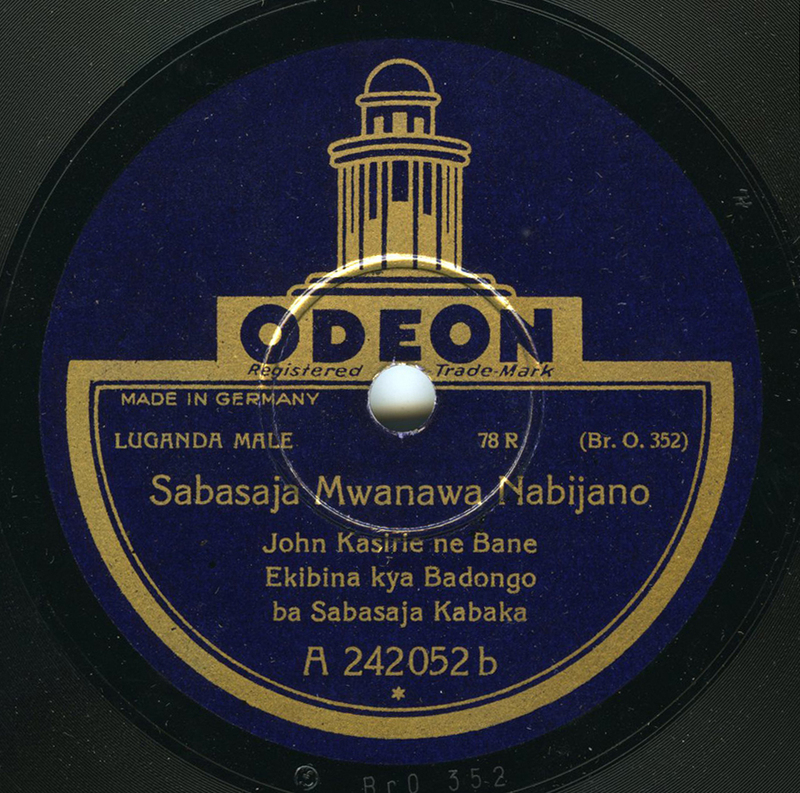 The successful German conglomerate Odeon was also recording in East Africa in the Spring of 1930, having sent engineers to Mombasa to record taarab music, but – unlike the other companies – also to Kampala, Uganda, to make that country’s first commercial recordings. The country now known as Uganda was, in 1930, a British protectorate, and would remain one until its independence in 1962. It fell under British rule during the infamous period known as the “Scramble For Africa,” and in 1894 it officially became known as the British Protectorate of Uganda. During the run-up to British occupation, Protestant ministers began appearing in the country as missionaries, some of whom were hosted by the CMS, the Church Missionary Society, a Protestant organization founded in 1799 as The Society for Missions to Africa and the East. Naturally, the relationship between the church and the local population must have been (and likely still is) extraordinarily complex, and it would be a mistake for me to expound upon it here, as I can’t claim expertise in the slightest. But, getting back to Kampala in 1930: on their trip, the German engineers from Odeon likely went to Mombasa in Kenya first, where they recorded 215 individual titles (the equivalent of 107+ 78s), after which they went to Kampala where they recorded a comparatively slight 60 titles. By June of the following year, Odeon had pressed 108 discs of music from Mombasa – virtually every master take from the sessions – and only 23 discs of music from Uganda. These records seem to be all we have from the Uganda of 1930, and the only commercially recorded Ugandan music captured for the next 8 years or so, when the British HMV company began recording in Uganda for the first time. 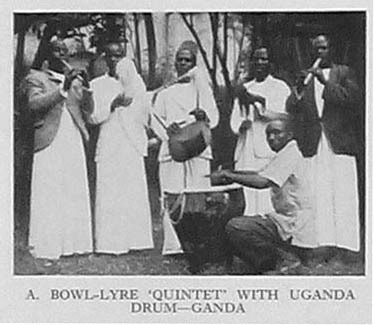 The western pattern of mechanical and commercial distribution of music was late in reaching Uganda – the Uganda Broadcasting Service, for instance, started only in 1954 – and thus the musical prestige held by the Church and her school system was – but for indigenous folk music – hardly challenged from any quarter. The contents of the first set of gramophone records made in Uganda in 1931 throw light on this issue. The set is remarkable in that it includes tribal African music of an extraordinarily pure and characteristic kind, and that these recordings were distributed through a subsidiary organisation of the Church whose prestige added much to the happy reception which these recordings were given. This was probably the first occasion on which the Church showed sympathy with indigenous folk song. Paul Vernon, in his article on Odeon Records, found evidence that these recordings sold quite well (except for the church choir recordings, which apparently didn’t sell at all!) and local distribution was through the Uganda Bookshop. About 500 copies each were pressed, and there were plans to release the remaining tracks over the following two years, though this is unclear, as in 1931, Odeon merged with most of the operating record industry in Europe to form EMI. I have a few of these Odeons from Kampala, and they are all starkly different in style. They feature the Christian choir from the Namirembe Cathedral, unaccompanied canoe songs, and today’s example, traditional songs featuring the thumping, plucked strings of the endongo bowl lyre, and the jittery bowing of Ugandan one-stringed tube-fiddles known as ndingidi. In this case, they are also accompanied by what sounds like a flute in the background. Hugh Tracey, when he recorded the same group over 20 years later, marveled at the group’s regal adornment of their instruments. The ndingidi and the endongo lyres were decorated with colobus monkey hair, and the hollow wood bowls of the endongo were laced with water lizard skin (the lacing is usually made from cow or calf skin). This is, in effect, royal court music, as the endongo has had a long association with Ugandan kings. These Odeon discs were well recorded in sonorous spaces, and if you’ve not heard this style of music before, you are in for a unique experience. I am indebted to British ethnomusicologist and an expert on Ugandan music, Peter Cooke, who has enlightened me with regard to these particular recordings, and supplied the bulk of relevant information here, along with the works of Werner Graebner. After listening to the disc and examining the label, Peter explained that John Kasirie was the leader of this group, which was known as Abadongo ba kabaka, or “the King’s endongo band,” a changing group of musicians known to have been active since before the mid-19th century. Peter introduced me to his colleague Dr. Sam Kasule at the University of Leicester, who graciously took some time and summarized the lyrics. The piece itself, the title of which is more properly written as “Ssabasajja omwana wa Nabijano,” translates to “Your Majesty, Child of Nabijano,” with “Nabijano” being another name for the Queen mother. A praise song, the singers extol the virtues of both the king and his mother, using the short form of Nabijano, or “Naba.” They declare that the king is different, special, and great (wanjawulo). The singer invites his musicians to join him in these praises, and they praise the Queen mother’s Mbogo – buffalo – clan (Dr. Kasule explained that in Buganda, princes belong to their mother’s clans). With many thanks to Peter Cooke and Sam Kasule. Please check out Peter’s illuminating liner notes to the excellent Honest Jons release Something Is Wrong, as well as his CD on Topic, The King’s Musicians: Royalist Music From Buganda-Uganda. Below: Ugandan lyre ensemble, ca. 1949-1953. Photo taken by Klaus Wachsmann. By far, the most popular posts on Excavated Shellac feature African music. In honor of that, I’ve decided to post something from East Africa this week, as a give-the-people-what-they-want goodwill thank you gesture. However, if you’ve come here only looking for African music, please take a look around and try another piece out. You never know what might grab you – perhaps a Bulgarian harmonium track, or a Turkish taxim. One of the main thrusts of this blog is variety of palette, after all. This week’s sonic diversion comes from Uganda, performed by members of the Nyoro/Haya culture. 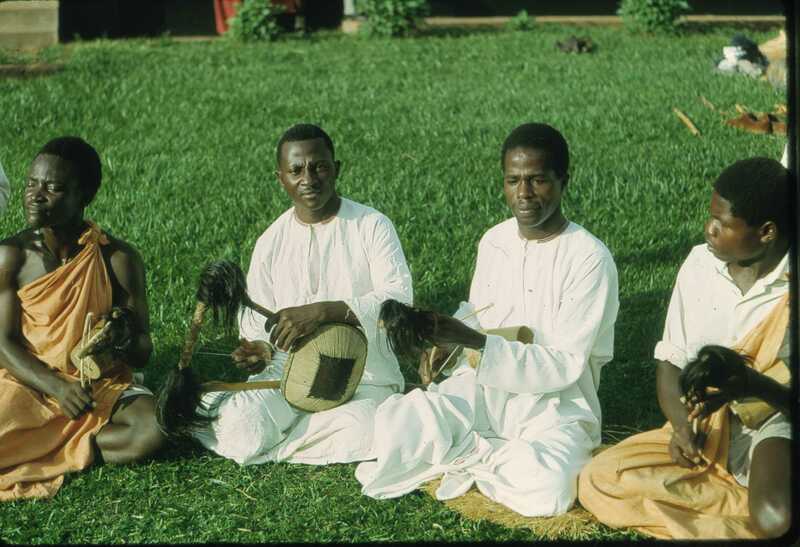 A group of singers accompanied by drum (ngoma) and the Nyoro/Haya rattle (nyimba). 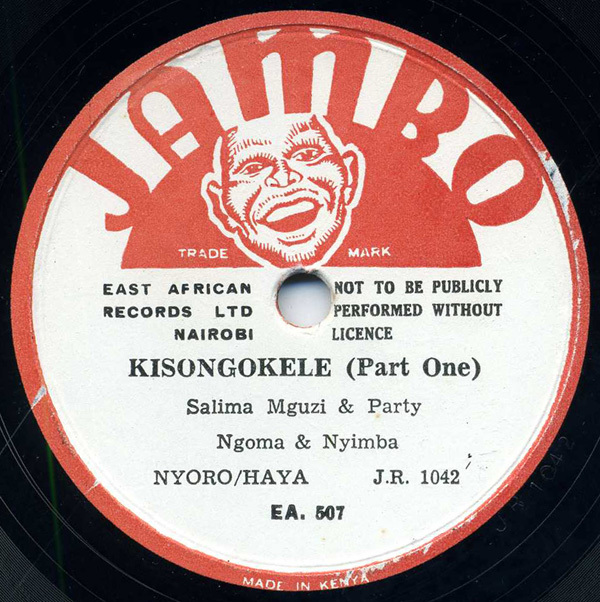 It stems from around the mid-1950s on the beautiful Jambo label. Jambo’s story is very interesting. It was the first independent East African record label, established in Nairobi, Kenya by two British gentlemen, in 1947, under the umbrella of East African Sound Studios, Ltd. They sent tapes to England and had their records pressed by Decca, which were then shipped by air freight back to Nairobi (a three-day flight distance at that time). By 1950, the company had fallen on hard times and there was a management shake-up, after releasing slightly over 200 records. The studio was closed down. East African Sound Studios, Ltd. was taken over by the African Ground Cotton Company. Otto Larsen, a Dane, was asked to help set up and manage a record pressing plant in a new building in Nairobi, and Jambo resumed in the early 50s, continuing to repress the best selling of their 200 or so records. Thus, the birth of the new East African Records, Ltd.
Amazingly, Larsen and crew continued to repress those same 200 records until 1955, when Larsen took it upon himself to start a recording studio in a Nissen hut on the property, which was formerly used to make cardboard pots for planting (a side venture of East African Records, Ltd., as was the sale of jukeboxes). Larsen began to travel in the region (Dar Es Salaam, Kampala), making further recordings for Jambo, and recorded much local talent in Kenya, many of whom traveled to audition in Nairobi. Taarab music was recorded, African acoustic guitar, accordion-based pop, Hawaiian waltzes from the Seychelles, and rural Ugandan music, such as we have here – pressed and packaged by Kenyan hands. By 1955, other independent labels were active in the region: Capitol Music Stores, Mzuri, AGS, Rubina and Rafiki, and Munange, to name a few. The majors were active as well: HMV, Columbia, and Gallotone and their subsidiary, Trek. Jambo continued pressing 78s (and 45s) until 1961, when it became Equator Sound Studio. They had released a total of about 1,000 records. Much of the information on Jambo came from Flemming Harrev’s informative article “Jambo Records and the Promotion of Popular Music in East Africa: The Story of Otto Larsen and East African Records Ltd. 1952-1963.” In Perspectives on African Music, Bayreuth African Studies Series 9, edited by Wolfgang Bender, 103-137. Bayreuth, Germany: Eckhard Breitinger, 1989.